A subject which I am very passionate about is waste plastic, food and anything which fits in between…We live in a very beautiful world and it is getting trashed by mankind in the name of greed, profiteering or just plain laziness because you can’t be bothered to dispose of it correctly. Second out of the starting gates is still food connected and we need to eat healthily to stay healthy…I mean who likes taking tablets and potions and feeling just blah? Two of my favourite ladies get together and the lovely Colleen is interviewing talented author Debby Gies…So head on over and get to know them both…Enjoy! This entry was posted in Book Launch Party Bus, Book Reviews, Cooking from scratch, No to food waste, Retired No One Told Me! 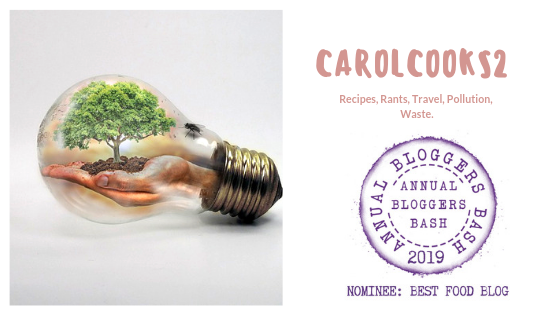 Weekly roundup!, Short Stories, Uncategorized, Waste not want not and tagged Authentic recipes, Book Launch, Book Reviews, Halloween Recipes, Halloween Trivia, Peanut Allergy?, Thai Food on October 21, 2018 by CarolCooks2. A dull gloomy day here but ideal for shopping…What did I get today ? Some lovely fresh coconut and other vegetables my favourite snake beans, fresh mint and coriander and of course peppercorns …I just love fresh peppercorns they make a lovely sauce. Which Tik made when we got home for our brunch. I hope you enjoyed my local shopping trip today and you will most probably recognise a few of the vegetables some which are eaten all over the world others which are not an Aladins cave full of fresh goodies. This entry was posted in A Taste of Thailand, Authentic Thai Food, Northern Thailand, Rural Thailand, Tessaban Market, Uncategorized and tagged Mok pla siw, Recipes, Thai Food, Thai life on August 25, 2018 by CarolCooks2. Welcome to my weekly roundup …you know the procedure by now..comfy chair, a drink relax and enjoy! My first post week was one which bought back memories of a lovely holiday in Malta and their lovely National dish of rabbit stew which in turn made me remember my granddad and my uncle Ken…Both of who worked on the land and taught me much when growing up…The rabbits were mostly poached(shhh) and his ferret definitely not a pet but that is life and how it is…The rabbit stew, however, my mum and Nan used to make..I loved it! The plan??? Keep the diary and weigh myself every Monday( no hopping on and off the scales)…Well…Today is Sunday and the lure of the scales just too much…4LBS… OFF! Following on from Fruity Friday and the red Bananas I discovered along with some things I didn’t know …That all red bananas are not naturally red…The ones on the bunch are but not the pretty looking red bananas in a dessert…They are red because they are cooked in Lime water?? A trip to the local market with my daughter in law and we found the red paste…Spoiler Alert! Today I will be cooking the green bananas and turning them into a red dessert and all will be revealed on Friday….. The tradition of making charcoal here in rural Thailand. Date time…I should be so lucky as sung by Kylie… Stuffed with blue cheese they are a wonderous thing or wrapped in bacon… I love those beautiful patterned Tagines, don’t you??? Lastly …Are you still with me??? Do you need to take five, top up your cuppa ??? This entry was posted in A Taste of Thailand, Apple and cranberry stuffed Pork Loin, Authentic Thai Recipes, Carol's Cookery column on Smorgasbord, Fruity Fridays, No faddy diets just healthy food, No more diets!, No nasties make from scratch, Red Bananas, Retired No One Told Me! Weekly roundup!, Sally at Smorgasbord Health 2018, Uncategorized and tagged Dates, How to make charoal, Red Bananas, Rural Thailand, Thai flavours, Thai Food, Traditions on August 5, 2018 by CarolCooks2.